Men's Original Rubberized Raincoat is rated 5.0 out of 5 by 3. 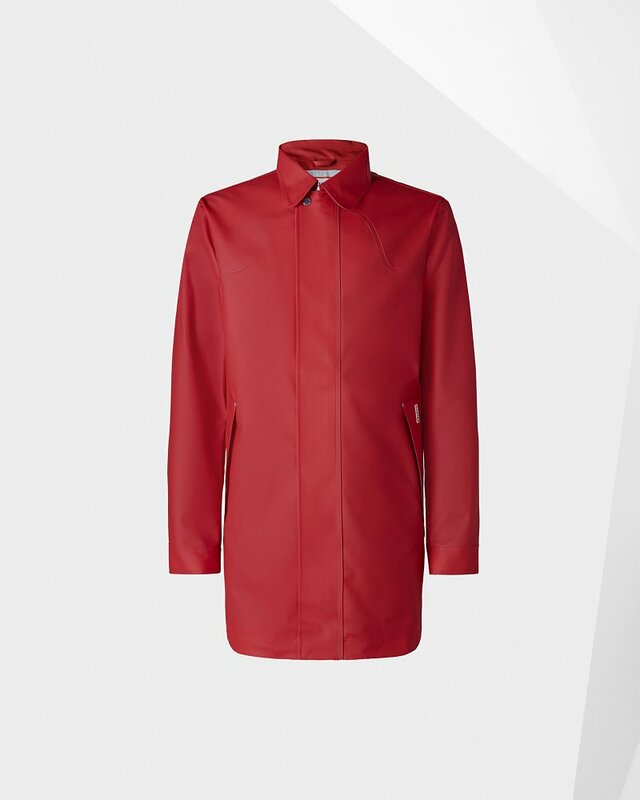 A fully waterproof raincoat with a matte finish. Crafted from knitted polyester, with a rubber-touch coating, Hunter signatures include a back storm flap with iconic Hunter moustache detail, alongside welded seams for full wind and waterproofing. Rated 5 out of 5 by drdan from perfect! as sleek and stylish as it is functional, protective, and...just cool! Rated 5 out of 5 by Jonty from I purchased the coat in yellow, since I was longin I purchased the coat in yellow, since I was longing for another like the one I had in childhood, which Hunter also made. It is a wonderful coat to travel with, since it is not as heavy as my trench coat. Every time I have worn the coat, people have stopped me on the street to rave about it, remarking how well and beautifully made it is! Please note, the HUNTER X TARGET collection is only available to buy at Target and as such must be returned to Target and not Hunter Boots. Only products purchased directly from the Hunter website can be returned or exchanged following the steps described below. If you purchased your Hunter products at a retail store or from other websites, these products must be returned to the original store or site they were purchased from. If for any reason you are not happy with your Hunter products, please follow our Returns Procedure. Hunter reserves the right to refuse the return of products, which are not sent back in accordance with our procedure and we may request that you pay for the shipping of such goods back to you. Our returns procedure does not affect your statutory rights. If you have any questions, please contact our customer service team at 877.495.1500.For full details on our returns policy including your statutory right to cancel, please consult our Terms and Conditions. You may return or exchange new, unworn or unused products within 30 days of the date the products were shipped to you. All products must be returned to us unused, in a fully re-salable condition, with all original packaging. We ask that you take care of returned products. If the goods have been used, they will be returned to you, and no credit will be issued. Please ensure that your return package is packed and sealed securely. In cases of exchanges for an item of lesser value, we will credit the difference back to the original card used for purchase. We will need to receive the returned item back in a sale-able condition for us to initiate the exchange. If you would like to make an exchange for a style of a higher value than the item originally purchased, you must send back the item, following the instructions below, and submit a new order online for the new item. All exchanges are up to Hunter's discretion and subject to availability of suitable replacement stock. Log into your account from the Sign In link located at the top right of our site. Under the Order History section of your account, locate the order number that contains the item(s) that you wish to return or exchange and select Return/Exchange. For each item, select the reason for the return along with whether it is being sent back as a return for refund or exchange. For exchanges, select the new color and/or size that you wish to receive. If you would like to exchange for a different style up to the same price as the original item, please contact our Customer Service team at 877.495.1500 or contact us here. If exchanging, confirm the address that you would like to receive your new item at, and submit your request. Print your UPS prepaid return label by clicking on the Return Label link. A copy will also be sent to the email address on file for the account. Attach the label to your shipping box and drop it off at your nearest UPS location. If you are unable to log into your Hunter account or need any assistance initiating your return/exchange, please contact our Customer Service team at 877.495.1500 or contact us here. Please do not return items to our head office address in New York City. All returns are processed at our warehouse. This only applies to products purchased via this website that are within warranty. Hunter product purchased in a store or on another website must be returned to the original place of purchase. It is essential for both hygiene and for a thorough assessment that faulty items are returned to us in a clean, dry and presentable fashion as well as the original packaging. Occasionally a white powdery marks or 'bloom' may appear on your boots. This is not a defect, but a release of natural protective wax that can be easily wiped clean with a damp cloth. For more information on this phenomenon, see our FAQ page. Full information on looking after your Hunter boots can be found on the Care Information page.